Razzle Dazzle Quilter: Still making bubbles! When my Great Nephew Jackson was staying over Christmas he mentioned that he needed a bigger quilt. Nana Peggy pulled out some quilt tops for him to look at. Jackson selected Science Fair. In keeping with the modern style of this quilt and to compliment the way some of the hexagons look like they are floating off into space I quilted a new to me bubbles/balloon pattern all over the quilt. I like how it looks. Lots of texture and a feeling of movement. No too much stitching so the quilt still feels nice and cuddly. I’m sure Jackson will enjoy snuggling under his quilt. Your quilting is amazing on this! 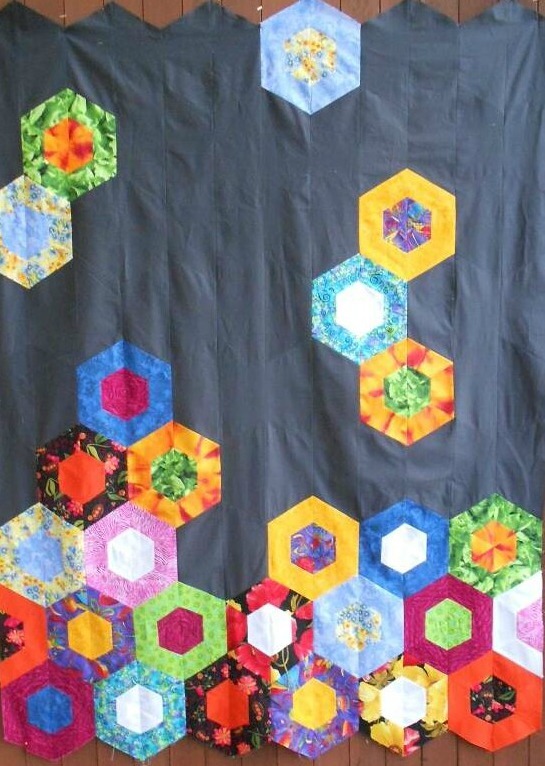 I love the contrast on the bright hexies against the dark background and I especially love how you left the "points" on the top and bottom edges. What a fun quilt! How big are the hexagons? This is such a fun quilt and I really like the quilting...Jackson did a great job picking that one out and Nanna and Aunty Linda did a wonderful job finishing it off so beautifully. Super quilt and quilting!!! It is a modern marvel of artwork!! Just wonderful including the top and bottom edges... brilliant. You have to be thrilled!!! This looks really great. Awesome movement and I agree with the comments above about the edges. Lucky Jackson.